Reed Electric has served White County and surrounding area with excellence gaining over 24 years of experience as a family owned and operated business. Licensed, bonded & insured with an A+ rating from the Better Business Bureau, Reed Electric can handle all your electrical needs. Does your home or rental property need to be rewired? Electrical work can be dangerous and difficult to navigate. Let Reed's dedicated electrical experts handle it for you! Reed also offers a wide range of industrial and commercial wiring solutions. Reed can even offer a variety of financing options for large jobs. Whether you need your current equipment upgraded, 24/7 emergency service or regular maintenance, Reed Electric offers the experience, skill and knowledge to get the job done. Call them today for a free estimate! 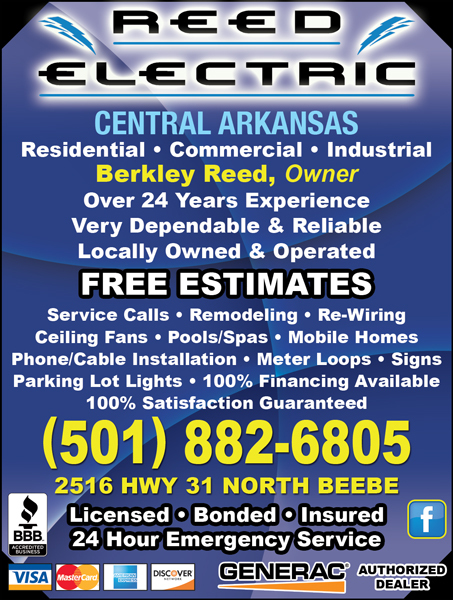 Reed Electric 2516 Highway 31 North Beebe, Arkansas (501) 882-6805.